Published on NowUC on the 23rd of November, 2010. ON 12 October, 10,000 people crammed into a large tent on one of the University of Canberra’s ovals. They were here to farewell a band that have released seven studio albums, won 18 ARIA awards and topped the annual Triple J hottest 100 music poll twice. In April, Powderfinger announced that this year’s 34 date “Sunsets” tour would be their last. Taking their name from a Neil Young song, Powderfinger formed in Brisbane 21 years ago – before a large portion of their audience were even born. Kids in their early teens looking forward to seeing their first rock concert and middle-aged men wearing their well-worn Powderfinger t-shirts clamoured to get a good view at the front of the stage. Something for Kate front man Paul Dempsey opened the show with a short but enjoyable set, playing solo on an acoustic guitar. He received an enthusiastic response from the crowd, performing songs his solo album, Everything Is True and a cover of the MGMT song Time To Pretend. Jet were next on stage and played songs from all three of their albums. They gave the audience its first big sing along of the night with the piano ballad Look What You’ve Done, and then had the whole crowd moving to the international hit Are You Gonna Be My Girl. The sun set, the rain began to fall, and the road crew were preparing the stage for the evening’s main event, the now humid and steamy tent had filled to its limits. The crowd buzzed with excited chatter as they waited for the band whose albums had been glued to the nation’s CD and MP3 players for so many years. Vocalist Bernard Fanning, guitarists Darren Middleton and Ian Haug, bassist John Collins, drummer Jon Coghill and touring keyboardist Lachlan Doley took to the stage with a thunderous roar from the crowd. Their two hour set included a variety of fan favourites and it did not disappoint. It was the third time I have seen the band play live and it was certainly the strongest performance. It was the first time Kimberly Barnes had seen them live. The band opened the show with Love Your Way and kept the hits coming with the old and the new, Already Gone and Burn Your Name, to the delight of a manically appreciative audience. Powderfinger sounded just as flawless live as they do on record and Bernard Fanning’s voice had never been stronger. It was also a visually impressive show that made good use of lights, lasers and large screen projections of animation and imagery from their video clips. The band disappeared from the stage about midway through the set and popped up minutes later towards the far end of the tent on a smaller stage, to the bewilderment of those who suddenly found themselves at the back of the audience. The band performed Like A Dog before returning to the main stage. My Happiness, was one of the highlights of the night, the audience sang along loudly and passionately to every word. These songs had a powerful effect on their fans, it is rare to see such a large crowd connect so strongly to the music. 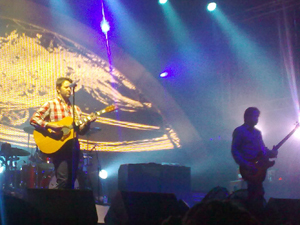 Powderfinger performed two encores and closed the show with a beautifully performed, extended rendition of These Days. As the road crew dismantled the set and threw guitar picks and gaffer-taped set lists towards the few remaining fans who lingered, it was easy to question whether this was really the end for Powderfinger. The band played with the experience and cohesion of a group that has been together for decades and at the same time have maintained a rare energy and enthusiasm. Powderfinger played their final show in Brisbane on Saturday night (13th of November). Over 300,000 people attended the two-and-a-half month tour. This entry was posted in Music, Other Writing. Bookmark the permalink.